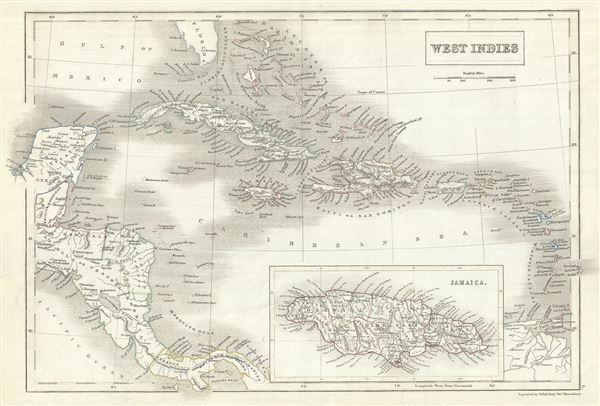 This is a fine example of Adam and Charles Black's 1844 map of West Indies. Centered on Haiti or Santo Domingo, it covers the Caribbean from Florida to the Gulf of Panama and from Yucatan to the Lesser Antilles and Barbados. It includes the Bahamans, Cuba, Jamaica, Haiti and San Domingo (Hispaniola), Porto Rico, the Virgin Islands, the Leeward and Windward Islands and Trinidad and Tobago. It also shows parts of Guatemala and the Isthmus of Panama. Various towns, cities, rivers, mountains, islands and several other topographical details are noted with relief shown by hachure. Black's map also identifies the Mosquito Gulf or the Bay of Mosquitoes, a corruption of Moskito, a local indigenous tribe. An inset near the bottom margin features Jamaica in detail. Undersea features as the Florida Reef, Pedro Bank and the Cay Sal Bank area also noted. This map was engraved by Sidney Hall and issued as plate no. L in the 1844 edition of Black's General Atlas. Rumsey 2305.060 (1854 edition). Philips (atlases) 4334.